There’s a new restaurant in Kennebunk’s Lower Village, just across the bridge from Kennebunkport’s Dock Square, right on the river. And all we can say is WOW! The Spirit of Massachusetts has been the dream of Pilot House owner, and longtime Kennebunks resident, Dwight Raymond for some time. Dwight also owns and runs the First Chance Whale Watch and Kylie’s Chance Lobster Cruise. In 2014, he sailed a 125-foot long schooner up the Kennebunk River and set about turning it into a sea floating restaurant. 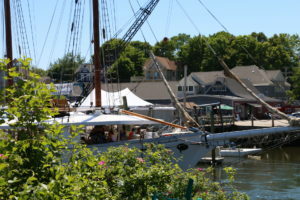 The Spirit of Massachusetts was built in 1984 in Charleston, South Carolina and has spent most of her life sailing across the Atlantic Ocean from Canada to the Caribbean and even as far away as Africa before being moored here in the Kennebunk River. It took a little time, but this family owned business has finally opened for their first season earlier this June. The schooner is anchored at Performance Marina in Kennebunk’s Lower Village just behind the local’s favorite Pilot House restaurant. All of the original rigging is still in place so in theory, the Spirit of Massachusetts could sail at any time with just a few modifications. The restaurant seats 100, 60 topside under the big canvas top looking out over the river. Below decks, wooden tables and benches have been installed to seat another 40. There’s a bar on deck, perfect to sit with a beer or cocktail and wave to the passing boats on the river. As you can imagine, there’s limited space so the Dwight’s had to be creative in setting up their floating restaurant. Food and drink are served in recyclable/disposable plates and glasses to cut down on the amount of dishes that need washing. All of the food is prepared on the boat and is a nice selection of tapas style and small plates. We’re working our way around the menu and it’s all been good. They offer a nice selection of seafood including a Raw Bar with Local Oysters, Crab Claws, Lobster Tail and Prawns. Traditional New England Clam Chowder and Homemade Lobster Stew can be had along with Caesar Salad (white anchovies on the side please), Tomato and Watermelon Salad (made with Heirloom Tomatoes and Goats Cheese – Yummy!) or a simple Fresh Greens Salad with a Maple Vinaigrette. If you fancy keeping your seafood simple, they also serve Steamers and 1 1/4 Lobster with Corn on the Cob. Small plates are reasonably priced ranging from $8 for Chicken Satay Tacos (an early favorite of ours) to $16 for either a Cured Meat or Local Cheese Plate (see our Blog about Maine Artisan cheese makers). 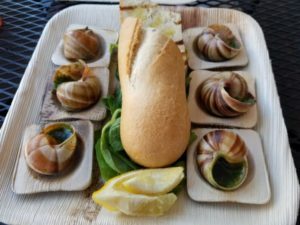 They even have Escargot – one of the few places in the Kennebunks with those on the menu. Their Traditional Lobster Roll is a little pricey at $21, but it’s loaded with fresh lobster and did we mention that you’re eating it on a beautiful sailboat on the River? For More Information: Call The Pilot House on (207) 967-9961. The Spirit of Massachusetts is open seven days a week from 11am until 10pm during the summer season. They are a short 15 minute stroll from our Bed and Breakfast. We hope you’ll stop in and check them out when you are next visiting Maine’s southern coast! This entry was posted in Food by 1802House. Bookmark the permalink.